With the release on June 30th a Settings icon has been added to the right upper corner of the WAVE OnCloud management portal. Access the Customer or Partner Employees page to add, remove, or manage Employees. 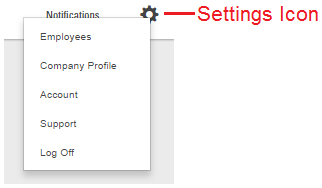 The Employees page was previously accessed from the main menu but is now available only in Settings. Update your Company Profile such as address, phone number, and other information specific to your company. Log Off WAVE on Cloud.